The issue of global internet freedom transcends partisan politics. Since the 1990s the development and expansion of a free and open, globally interconnected internet has been a policy goal of successive Democratic and Republican administrations. It is key to the advancement of human rights, innovation, and economic prosperity around the world and is consistent with U.S. commercial and geopolitical interests. Despite these efforts and clear benefits that billions of people around the world have enjoyed, freedom online is under threat. Without positive leadership by the world’s major democracies, the world’s internet users can expect a continued decline in their freedom to express themselves and access information, while suffering increasingly aggressive attacks by a range of state and non-state actors. A community of Americans who work across the private and nonprofit sectors, who include Democrats, Republicans, Libertarians and Independents, is united in the hope that the administration of President-elect Donald J. Trump will protect, promote, and strengthen freedom online–at home and around the world. This paper offers a framework for thinking about how the the Trump administration’s policies can build on the work of previous Republican and Democratic administrations by continuing to positively support and shape global internet freedom—a policy objective that transcends traditional partisanship. 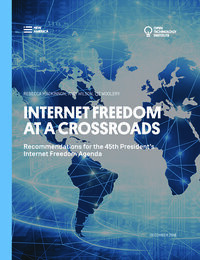 It sets forth a number of recommendations for the next administration’s global internet freedom agenda. The goal is not to provide an exhaustive list of everything we would like the next administration to accomplish in relation to internet policy. Rather, it articulates why, how, and on what issues the United States can and should assert leadership.